Blain|Southern London is delighted to announce Me Somewhere Else, an exhibition of new works by Chiharu Shiota. 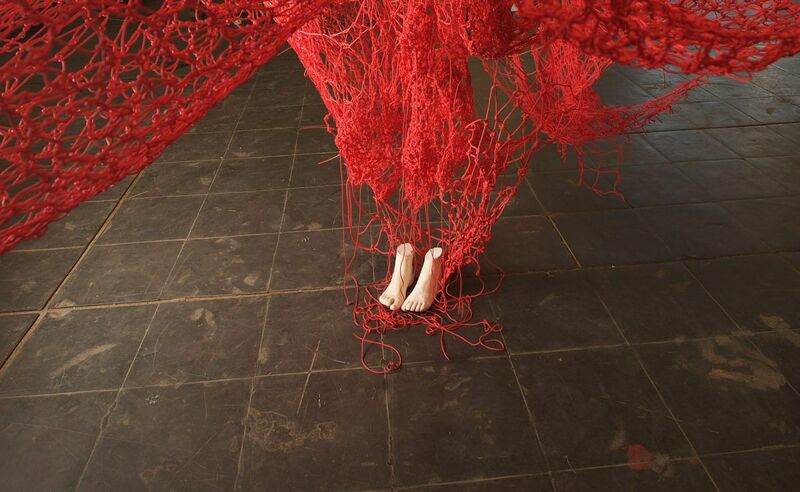 The artist’s rst exhibition at the Londongallery, Me Somewhere Else will include one of Shiota’s site-specic installations, sculpture and works on canvas. Based in Berlin, Shiota (b. 1972, Osaka, Japan) is best known for her immersive installations, such as The Key in the Hand, with which she represented Japan at the Venice Biennale in 2015. Using thread to ‘draw’ in three dimensions, she weaves intricate networks of yarn into and across spaces. Personal experiences are the starting points for her works, which explore the relationships between the body, memory, life and death. The titular installation Me Somewhere Else continues Shiota’s exploration of thread as a medium but hereshe utilises the material in a markedly different way, using her ngers to knot red yarn into a vast net.Suspended from the gallery ceiling, the net is a billowing mass which rises from a pair of feet that rest onthe oor below. Cast from the artist’s own feet, their solidity and permanence contrast with the usuallyephemeral nature of her installations. The colour of blood, the red yarn is laden with symbolism, for the artist it alludes to our connectedness to each other, the interior of the body and the complex network of neural connections in the brain.